The Indian financial services industry has undergone significant changes over the years, particularly in the last decade, and continues to evolve today. 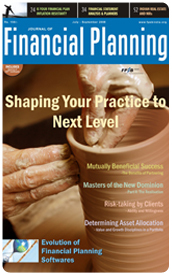 Financial Planning - a distinct element within the spectrum of financial services industry - is still relatively a young discipline. But personal finance products & services are increasingly becoming an important part of this industry as the Indian consumers seek to maximize and optimize the potential earnings and fruits of their hard-earned money. Currently, there are distinct divisions within the financial services industry. A person goes to a bank to save his money or to get a loan. He buys stocks and bonds from a broker. He purchases insurance from an insurance agent and mutual funds from a mutual fund distributor. The regulation of the industry reflects the division of these transaction-based services. However, financial services, especially on the retail side, have undergone a major transformation and financial consumers are demanding a holistic & comprehensive approach to their personal finance. Various factors have catalyzed this change like privatisation of insurance and mutual fund sectors has increased product options for the investor. Second, fluctuating interest rates and the end of ‘guaranteed return’ products have prompted investors to look for alternative modes of investment. And also with a number of mis-selling instances taking place in the financial markets, investors’ confidence in ‘advisors’ has been shaken and the investors are asking for a ‘trusted financial advisor’. This section is an attempt towards bringing to the forefront the challenges that today’s Financial Advisory community is facing in the competitive & booming markets. And at the same time showcase the opportunities which can be tapped by this community by adopting the Financial Planning discipline in their business and guide them with a pathway. Click on the Menus on the left to learn more about a Career in Financial Planning and benefit by pursuing the profession in its true sprit.